If a customer wishes to use a larger tire, they’ll need to utilize one of the golf cart lift kits available today. Which lift kit is best for their customized golf cart. If you don’t make the right choice, they’ll be unhappy with performance and durability down the road. Additionally, if they don’t understand why a particular choice is advised, they may not trust what you’re trying to add to the golf cart. Many sales are lost because a customer doesn’t understand one element that’s necessary to enable a preference they have. Many customers prefer spindle lift kits because they’re the easiest to install and manage. They’re also affordable to buy and maintenance. For customers who want a lift kit but don’t want to choose something too extravagant, this pays off. It uses the standard suspension of the cart and simply replaces the spindle length. The spindles are also larger. This offers the added benefit of giving the cart a wider base. No one complains at better stability. Because spindle lift kits increase the base of the cart, they allow you to utilize large wheels that are offset from the cart. These can allow better traction, greater tire durability, nicer off-road performance, and a unique look. The added option for heavier duty spindle lift kits further enables the customized golf cart to perform reliable off-road and hauling duty. Perhaps no lift kit better combines increased performance with affordability and ease of installation. A-Arm lift kits replace the front suspension of a customized golf cart. This results in a smoother driving experience with refined control. These are very popular, and also enable larger, more heavy-duty tires. The best A-Arm lift kits use a circular tubing that gives the cart increased rigidity. This can help substantially with roll resistance, and control on tight turns and uneven ground. Larger tires are possible with A-Arm lift kits, although not to the extent of a spindle lift kit’s offset tires. These lift kits are suitable for a customer looking to save money. Here, the front axle is replaced with a drop axle. The axle height is increased, but you can keep your stock spindles. They’re easy to install, but for customer satisfaction, they won’t compare to comparable Spindle or A-Arm lift kits. These lift kits simply boost the height of the golf cart. They’re a money saver, essentially just adding steel blocks under the suspension to increase height. This is fine for a customer wishing to add height to their customized golf cart, especially when the golf cart will be used in favorable conditions. For those looking for increased performance, rigidity, or control, especially in off-road and off-golf course situations, block lift kits aren’t advised. One of the widest selections of lift kits you’ll find is available through Build Your Golf Cart. 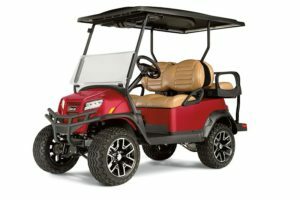 A subscription golf cart customization service built for dealerships, it contains a wide selection of customized golf cart lift kits and other customization options. It’s constantly updated so that you have access to the latest options and even stock availability. A design feature even makes it easier to make adjustments alongside a customer, explaining the different options as you go. This helps them visualize the differences and better understand why you’re advising them on particular options.